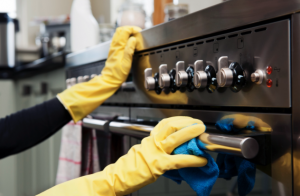 Royale Eco Cleaning Ltd understand that scrubbing a greasy oven is one of the least popular household chores, so why not sit back, and let us handle the hard work for you. Royale Eco Cleaning ltd will deep clean your oven, hob, Extractor and microwave using non caustic, non toxic, fume free, eco friendly products, to a standard they have not seen since your appliances were new. Ovens, all types of ovens, commercial and residential. We can rejuvenate any oven, hob, extractor fan, microwave or barbecue with our no added caustic system to get things sparkling clean, safely. With Royale Eco Cleaning Ltd, our friendly, professional service. We recommended depending on house hold numbers, usage or spills a, minimum of 1 – 2 ‘ 3x a year. Professional oven cleaning causes minimal disturbance to the family home, unlike off-the-shelf domestic oven cleaners which pose a risk to children and pets. The appliances are safe and ready to use immediately afterwards. Royale Eco Cleaning Ltd uses an innovative, no added caustic system, which means your kitchen is safe, hygienic and free of nasty fumes. Our process removes all grease, fat and burnt on food whilst fully protecting the enamel surface of your appliance. 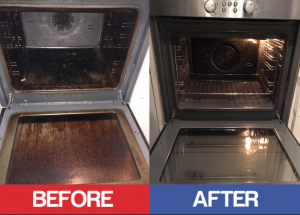 We can help self-cleaning ovens get their sparkle back!